Montana is a great state for gold panning as there are plenty of different prospecting areas. The state's rich history of gold mining adds to the appeal. Reports of gold in Montana first emerged in 1852. However, mining did not begin in the state until gold was discovered at Grasshopper Creek in 1862. In the decades that followed, further discoveries occurred all across the region. Although reports of gold slowed in the 20th century, they did not die out completely. In 1989, the Highland Centennial nugget was discovered in the Highland Mountains. This nugget weighed over 25 troy ounces and it was one of the biggest finds in Montana mining history. Its discovery inspired a gold panning renaissance in Montana which continues to this day. It's impossible to discuss gold panning in Montana without mentioning Helena. The state's capital city, Helena owes its existence to Montana's 19th-century gold rush. Established in 1862 as a mining camp, it quickly became one of the largest producers of gold in all of Montana. Last Chance Gulch was one Helena's most popular prospecting locations. In just 20 years, it's said that more than $3.6 billion worth of gold was discovered there. Today, Helena attracts visitors from all across the United States. It also brings in its fair share of international travelers. Many of these tourists come in order to learn about the city's mining history, but there's also no shortage of people hoping to actively participate in it. Gold mining is still practiced today in Helena. The Bureau of Land Management lists a total of 842 active mining claims in the city. These mining claims are complemented by numerous recreational panning areas located throughout the region. There are a number of laws that govern prospecting in Helena National Forest as well as the other National Forests in Montana. Most of these laws also apply to Montana in general, so you should give them sufficient attention before prospecting. To summarize, panning doesn't require any permits. Small sluices are allowed, but suction dreding is heavily regulated. A detailed breakdown of Montana's gold mining laws can be found on the USDA's official PDF guide for prospecting. Gold-bearing rivers run throughout Montana, making it one of the richest states in America. Naturally, veteran prospectors prefer some of these rivers to others. 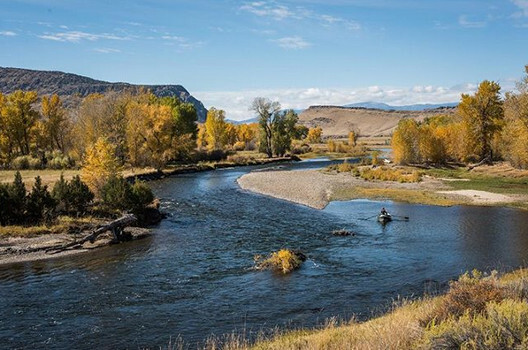 Below we will review a number of Montana's most popular prospecting rivers. A tributary of the Jefferson River, the Big Hole River is located in Beaverhead County. Gold was first discovered here in 1862 and prospectors then quickly descended upon the area. Over the following years, an estimated $5 million worth of gold was discovered in Big Hole River. Although a lot of gold was extracted here during the height of its popularity, it remains one of the richest rivers in Montana. The promise of placer gold continues to attract prospectors to the Big Hole River. Montana prospectors regularly pan in the Blackfoot River. But with ample opportunity for recreational activity, the Blackfoot River is also frequented by fishermen, swimmers, and kayakers. This makes it a good choice if you're hoping to do some panning during a family vacation. The Blackfoot River runs through the town of Lincoln, which is famous among veteran Montana prospectors for its heightened gold production. Placer gold is regularly found in the area. Lode gold is less common in Lincoln, but nuggets have been discovered on a number of occasions. Those prospecting in Lincoln should not limit their panning to the Blackfoot River. Gold Canyon Creek, Beaver Creek and Snowshoe Creek are also good prospecting spots. The longest river in North America, the Missouri River is a favorite of Montana prospectors. To the northeast of Helena, you'll find a stretch of the Missouri River that has produced large amounts of placer and lode gold. Meanwhile, the nearby El Dorado Bar is noteworthy for its production of sapphires. Just south of the town of Cascade, the Missouri River contains placer gold. Placer gold can also be found at Indian Creek, a tributary of the Missouri River that runs by Townsend in Broadwater County. The Bitterroot River is generally passed over by all but the most knowledgeable prospectors. This is largely because there hasn't been a major find in the river for some time. But in the late 1800s and early 1900s, the Bitterroot River was a steady producer of placer and lode gold. In Ravalli County, the Bitterroot River joins Hughes Creek. Hughes Creek is noteworthy for its impressive production of placer gold. Between the years 1904 and 1948, more than 80 percent of placer gold mined in Ravalli County came from Hughes Creek. We will concede that the Bitterroot River is not nearly as rich as it once was. However, there is still significant gold for the taking for any prospector who knows what they're doing. Novice prospectors are less likely to experience success in the area. So if you aren't confident in your prospecting skills, then try panning in one of the other rivers listed in this article. 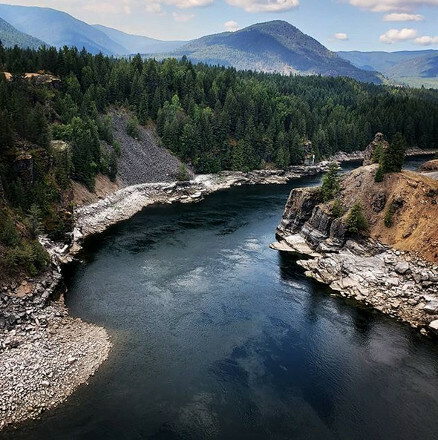 The Clark Fork River is more than 300 miles long and runs from Idaho to Montana. Given its size, it's not surprising that this river has long been a regular producer of gold. By 1954, more than 100,000 ounces of placer gold had been extracted from a single tributary of the Clark Fork River. Around the same time, lode gold was discovered in its waters which led to another surge in popularity. Today, the Clark Fork River is strewn with abandoned mines. Many of these mines are still a cause of pollution in the river. For this reason, we urge prospectors to be particularly mindful when prospecting here. To avoid contributing to pollution, be sure to properly dispose of any waste you create while panning in the Clark Fork River. The discovery of the Highland Centennial nugget in the 1980s showcased the opportunities that still remain for prospectors in Montana. Large numbers of prospectors visit the state to this day, all searching for the next Highland Centennial nugget. But remember that gold panning in Montana isn't reserved for those legitimately trying to get rich. Recreational gold panning is common in Montana and it's a great way to introduce children to an important part of America's history. It's also worth noting that neighboring Idaho is another good state for prospecting.